There is a trick some speakers do, that tries to build empathy in their audience. They share a personal story. They offer an intimate confession that gives the people listening a hook that will spark their attention for the half an hour that follows. I’m not going to use that trick. I am however going to try this one. Hands up if you use empathy in your work. Hands up if you don’t. Will anyone here admit to not being empathetic? 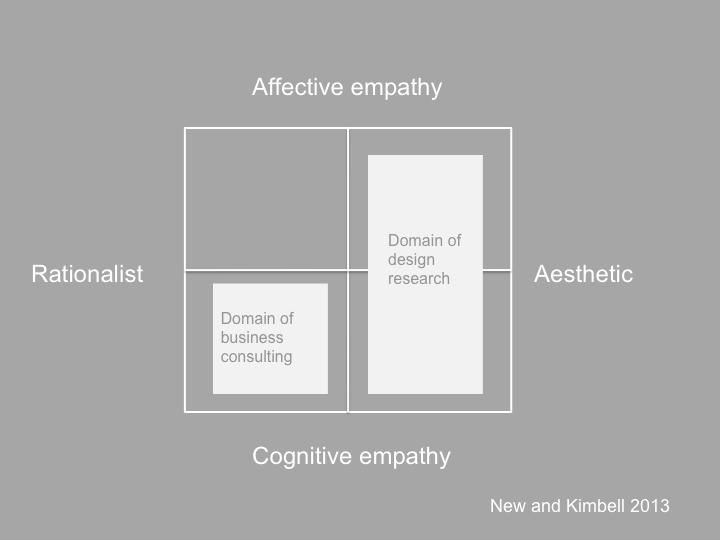 What I am going to do in this talk – which is going to be more agonistic than the kind that starts with a story – is explore what is going on in the fetishization of empathy within design research over the past decade (see for example ). To start off, I should say I am not anti-empathy, or anti-human centred design. But what I am going to do is try to dig around a little to help us think about what empathy is doing for us in design research, and what it is not doing. There is one main reason I’m doing this. In my work teaching MBAs, and advising entrepreneurs, I keep coming across managers who have got the empathy bug. Apparently it’s the most valuable thing they teach at Harvard Business School. These managers want to be empathetic. They want the services they are responsible for to engage better with users. They think design thinking is the way to make that happen. Quite often they think that they are pretty good at doing empathy already so they don’t need designers to do it for them. So with empathy now being taken up by other fields, it’s worth looking at what is going on in so-called empathetic design research. What comes with empathy? And what does it ignore? Is it the thing that’s distinctive about design research? A second reason is that the strengths of a practice are often its weaknesses, so it’s useful to step back and understand the issues and potential in a construct like empathy. However this is not going to be a full-blown genealogy of empathy. But I will start with what academics are supposed to do and go back to the literature. Here’s the literature I want to start with. Star Trek Next Generation (TNG) is not an academic literature but it is a world which explores ideas and builds on them to create new ideas. I propose that we can see Star Trek as a piece of design research - specifically, as an example of what Ilpo Koskinen and colleagues in their book Design Research Through Practice call constructive design research. Gene Roddenbery, the creator of Star Trek, and his colleagues, the TV studios, the actors, the audiences, and all the specialists involved, together built a world and put it to use in the sense of trying it out over several seasons. I’m going to come back to this idea of constructivist design research at the end of my talk. To help us think about empathy I want to enlist one of the characters from TNG, Deana Troi who has the role of ship’s counselor on the USS Enterprise. Half human, half betazoid, Counselor Troi has the capacity of being able to sense other people’s ideas and feelings. In TNG they refer to this as telepathy, because she can do it at a distance. But in fact what you see mostly in the seven series of TNG is Counselor Troi having a face-to-face conversation with someone, or making observations about people in front of her or a nearby planet. She doesn’t do a lot of remote fieldwork – her practice is very interactive and it looks a lot like some versions of empathy in design research. Let’s have a closer look at this practice. First of all, Counselor Troi is able to develop an understanding about other lifeforms, and then create an analysis, which she shares with her colleagues, often Captain Picard. Often she’s asked to do some data gathering and form an opinion alongside Mr Data, the android, and Lieutenant Worf, who’s a Klingon and claims to be very rational. In this clip, note how the male officers are seated on one side of the table, while Conselor Troi and Dr Krusher and the android (and so neither male nor female), Mr Data, are on the other. Against the backdrop of current conversations about big data versus what ethnographer Tricia Wang calls thick data, TNG looks ahead of its time by having Captain Picard invest his trust in Troi’s embodied analysis. In this clip we can see Troi’s perspective is taken seriously. She’s part of the officers’ discussion as the whole ship and crew at risk of being incorporated into the Borg. It’s her analysis that crystallises the challenge that the Borg represents to the Enterprise. But as a part-betazoid, or maybe it’s her human half, Counselor Troi is also able to experience some of the feelings of the people she is studying. This is not always a pleasant experience for her and is sometimes alarming for the people around her. Counselor Troi is aware that she or others will use that analysis to take action. The research she does is not just for interest, but is part of the way the crew of the Enterprise reach decisions about the course of action they should take. One of the consequences of being intimate with other lifeforms like this is that Counselor Troi has a responsibility to speak up and challenge what’s going on. In this clip where she’s temporarily in charge of the Enterprise, Troi is in the position of taking sole responsibility for the action that will result from her empathetic sensing. Counselor Troi’s capacities are brought home in an episode in which she loses her empathetic powers. Despite all the knowledge at the disposal of a Starfleet sick bay, Dr Krusher is unable to give Troi much help. Faced with the loss of her empathetic core, Troi is horrified to imagine what life is going to be like without the ability to empathise. These clips from TNG nicely present some of the issues that result from empathy in research for design, New Product Development and innovation. My Oxford colleague Steve New and I have written a recent paper (available here), which goes back to more conventional academic literatures and tries to separate out the different strands that often get bundled together in the term empathy. Here’s a typology of different aspects of empathy that draws on this. The first is what we call cognitive empathy. This is the empathy that comes from trying to put yourself inside the shoes of the user to understand their world, their point of view. This is me imagining what would it be like to be you. It’s ‘I want to understand you’. This is the core territory of Counselor Troi – it’s key to her role on the Enterprise. Her job is to understand what’s going on for other lifeforms, sometimes aliens the crew encounters, sometimes the crew themselves. This is central to much design research, even before it got tagged with the term empathy. Depending on the version of empathy you subscribe to, it might just be an act of imagining a user. Or you might actually do some research. If you take seriously the word ‘research’ then pretty soon you need to start getting clearer about your research questions, your choice of methods, and your theoretical and methodological commitments. So in cognitive empathy is about recognising otherness, but on the one hand it might be in the domain of the imagination, or on the other, it might involve research. The second type is affective empathy. This is the kind of empathy where you don’t just try to imagine the other person’s world and their feelings. You have the feelings yourself. This is ‘I feel your pain’. It involves emotional labour. And this is what we see Counselor Troi doing often in Star Trek. In the sanitised, organised world of Starfleet, Troi sometimes brings these emotions on to the bridge of the Enterprise. If we look at design research, this throws up the danger of designers becoming so focussed on the emotions they are experiencing, they forget what they are doing it all for. They are so busy having emotions, the project becomes about their experience not the interpretation and analysis that is part of research. A third type of empathy is performative empathy. This is where people who may or may not have empathetic capacities, present themselves as having them. They look like they are empathetic, but it’s just to achieve a goal. On Star Trek this is rarer – you’re either empathetic like Troi and to some extent Picard, or you’re Ferengi, Klingon or just standard issue male humanoid. In design research, this is the kind of empathy that comes when someone commissioning a project states that the end result must be user-centred, and the process must be participative. Yet curiously this manager is often unable to acknowledge the results of doing research if they disagree with the solution they’ve already decided on. This kind is a ‘me-too’ empathy. It throws up an interesting issue, about how you can tell whether research is really empathetic or not. Or, is something that appears to be empathy good enough? Finally there’s anti-empathy. In psychologist Simon Baron-Cohen's view, we owe much by way of scientific progress and technology to individuals who operate with less than normal empathy. On Star Trek, there are several characters who are anempathetic, notably the Ferengi and the Klingons. The android character Mr Data also lacks empathy although he’s very polite. Baron-Cohen says that empathy deficiency can lead to evil, but it can also be associated with a propensity for systematization and quantification. So he sees a positive connection between mathematics, engineering and Asperger's syndrome. In design research terms, this is the stance in which designers don’t do much imagining of users, because they don’t need to. This is ‘sod the user’. The negative impact of this is all the appalling designs we have to use when we interact with organisations and systems. If we take this simplified typology, empathy is not singular. It’s complex, contradictory and it hides the power plays involved in studying and interpreting what goes on in the world and the intended and unintended consequences that follow. So what is my problem with empathy? It’s not so much a problem with empathy, as much as problem with current accounts of empathy. The first issue is that what we hear described as empathy often presents it as an individual quality. On the one hand, there’s an emphasis on sensitivity to others. Counselor Troi is the emblematic empath, which is apparently linked to genetic traits she inherited from her betazoid mother, and possibly to her cleavage or the clothes she wears. But on the other, Troi’s sensibilities and skills exist within a collective world. She’s part of an organisational structure within Starfleet. She has a job to do, and a rank, and it is through her interactions with Picard giving her a seat at the table, and her other colleagues that her cognitive and affective empathy comes into mattering - part of the apparatus around her empathy. If we were to borrow concepts from Science and Technology Studies, we could say that Troi’s empathy is not a stand-alone quality, with clear boundaries, that exists outside the object of study, which is waiting to be investigated. Rather, this view sees empathy as constituted through intra-actions with the structures, reward systems and behaviours on board the Enterprise, the habits she picks up and the routines she takes part in. This version of empathy sees it as a collective accomplishment. The second issue I have is, why empathy now? How is it that technology giants are investing in public narratives about empathy? Or governments redesigning public services, at exactly the same point their political legitimacy is low as hardly anyone bothers to vote, and their interest in people’s experiences coincides with cutting costs and getting people to deliver things themselves? There’s the usual argument that all organisations have to innovate to create new markets to still be players in five years’ time. But dig deeper, and it begs a question about how the circulations of global capital have spawned a generation of people who want to render experiences visible in a world of dematerialised interactions. Someone else’s second-hand thoughts and feelings can be a powerful challenge to the ebbs and flows of immaterial capital. Strong emotion is often a starting point for action. It drives people to activism, to bringing about change. But too much focus on all the emotion can provide a distraction from the actual power relations. So there is a danger in being so caught up in the detail of the experience and ignoring the issues they are part of. A third issue with empathy is what it does to design research. Having made a distinction between affective and cognitive empathy, my colleague Steve New and I also make a distinction in our paper between a rational version of consultancy and an aesthetic version. Although this is crude, this delineates some of the differences between the modes of consultancy that exist as design research, and the mode that is business consulting. An even cruder version would say that on the right-hand side, where design research is located, are the nice guys. They care about users and their worlds, really want to understand and engage with them, and have their feelings too. But over there in the other quadrant is where the clever guys operate. They may have an empathetic relationship with their client, but they pretty much try to fit the client’s problem into a universe of problems with which they are familiar. On an individual level it’s clear there are people who can flip between these modes. The more interesting discussion is about whether organisations have to be in only one of these spaces. So does design research want to be operating in the domain it’s currently in, being nice guys, or does it want to be over on the left hand side with the clever guys? A final issue is that empathy often looks like a dumbed-down version of ethnographically-informed research. The danger here is that researchers think that the data “out there” is the truth waiting to be discovered and interpreted. This approach – based in Positivist science – gives researchers the idea that they are neutral carriers of that data back from the field to the sites where decisions are made. Crucially, this ignores what ethnographers trained in anthropology call reflexivity. Ethnographers are attentive to how they as researchers are brought into relation with the object of study. Instead of trying to walk an uncomfortable path between objective truth or subjective reality, ethnographers have developed an understanding that their work is constructivist. This means they pay attention to how they include and exclude different data, and their work of interpretation. I think there are other ways to do design research that avoids these problems. This approach harnesses some of the resources that empathy in its different variants brings, but does something slightly different and which is part of existing traditions in design research. Firstly, if we go back to the bridge of the Enterprise, what Troi’s practice does, and what some design research does, is expand the ontology of stakeholders and actors to increase the variance. What that means is that in constructivist design research, a diverse group of people and things are brought into relation with one another. Counselor Troi picks up what other lifeforms are thinking and feeling, and her analysis of this then changes what becomes possible for the Enterprise’s crew. This kind of design research changes what an issue is made up of. It involves creating not just artefacts or representations of research findings, but also new configurations of people and things, which involve new symbolic structures, behaviours and scripts and new value relations being formed. It doesn’t start with a given world, but creates a trajectory for a different one. It draws things together into new combinations and this is an active practice of including some things and excluding others. Secondly, after Troi has made her analysis and other colleagues have given theirs, this prompt questions about whose data is right, whose feelings, whose worldviews, or whose interpretations, matter more. Constructivist design research involves creating contestable boundary objects . It sets up these differences as a problematic to be worked through rather than ignoring the power plays in any project or organisation. Done well, it draws attention to the unintended consequences of decisions and the temporalities over which these come into play. It helps participants such as the people we call users, staff, managers, and clients help make sense of and situate themselves inside these configurations, and surfaces disagreements about them. And thirdly, this kind of design research prompts the researcher to investigate how to situate herself in the work. It offers what anthropologist Lucy Suchman calls located accountabilities. If we look at what happens with Troi, by accessing these other lifeforms’ worlds, Troi becomes mutually accountable to them. By making public these accounts and her own affective empathy, Troi then involves other crew members, resulting in an expanded set of accountabilities for the Enterprise. Constructivist design research helps participants become visible and accountable to one another as actors within these unfolding configurations. If these issues I have outlined matter, then it is time to start talking differently about the thing that is currently called empathy. This involves a move away from thinking of empathy as an individual trait, towards a collective capacity. The opportunity is to create a version of empathy that recognises its potential to constitute new configurations of people and things. So empathy becomes less about individual sensibility. And more about organisation design, culture, routines, habits, behaviours, reward systems, roles, and core assumptions about the nature of change and agency. In closing, I want to leave you with some questions to pose next time you reach for empathy to differentiate you from other kinds of researcher. Remember Troi. But don’t focus on her Starfleet suit, or her emotional sensitivity. Before you reach for empathy, ask where are you located and to whom and what are you accountable? All those emotions you are picking up, or experiencing yourself – what are they stopping you paying attention to? What do you get out of being a nice guy? What would happen if you stopped being a nice guy? Contestable boundary objects is not quite the right term but see also Noortje Marres (2005) Issues spark a public into being: A key but often forgotten point of the Lippmann-Dewey debate. In B. Latour and P. Weibel (Eds.) Making Things Public. Karlsruhe/Cambridge (MA): ZKM/MIT Press, and Carl di Salvo (2012 Adversarial Design. Cambridge (MA): MIT Press.